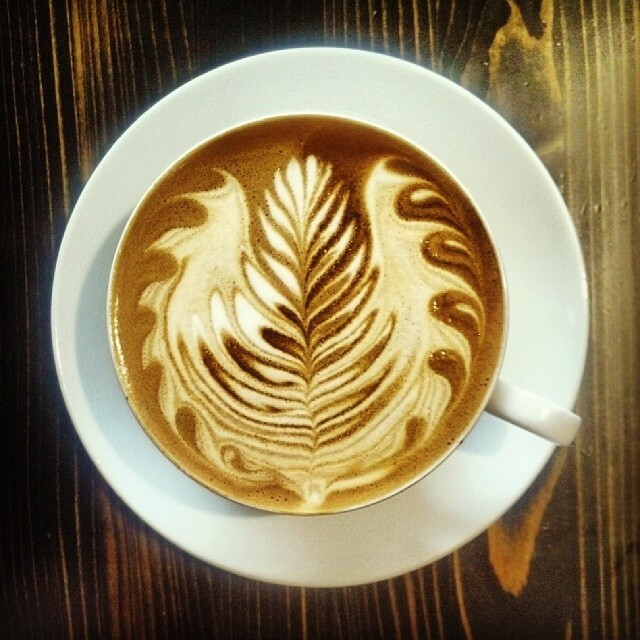 Utah’s coffee culture is a work in progress, yet to approach anything close to critical mass despite a fairly respectable number of coffeehouses that, for the most part, have managed to sustain themselves. However, only a handful of cities throughout the United States can make a legitimate claim to a coffee culture that challenges and elevates the consumer’s perception about what constitutes a truly excellent cup of coffee. Caffe d’bolla in downtown Salt Lake City. 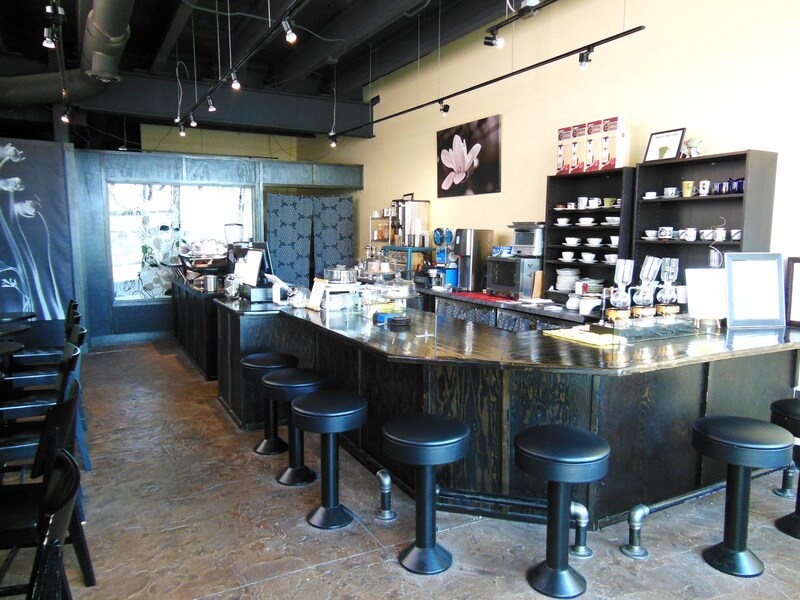 Since they opened their downtown Salt Lake City store nearly a decade ago, John and Yiching Piquet, the owners of Caffe d’bolla, have made coffee the soul of their business. Others might attempt to make that claim in the most casual or perhaps romanticizing sense of their marketing and promotion. However, Caffe d’bolla has set itself apart here in a unique market position that represents the exceptional standards in espresso principles, coffee roasting programs, and siphon brewing one would find at internationally respected coffee destination spots in Seattle, Portland, Baltimore, and, thousands of miles away, in Kyoto and Osaka. Caffe d’bolla’s history parallels this mindset in every iteration. When the Piquets opened in the street level space of the Stoneground Restaurant building on 400 South just across from the City Library, they had already spent years of research and planning, taking in many sources of inspiration including Espresso Vivace and Caffe d’Arte in Seattle and Ken David’s book ‘Home Coffee Roasting: Romance and Revival.’ A year and a half into their operations, they began roasting coffee on site, starting with a select yet modest range of single origin beans. 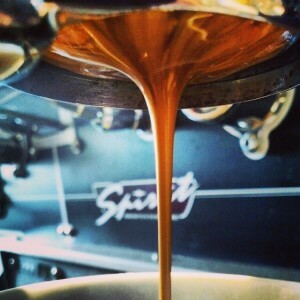 An espresso shot at Caffe d’bolla. The tasting experience at Caffe d’bolla had become so compelling and elucidating that the usual channels of marketing and advertising could be dispensed with completely. However, the Piquets knew the time also was ripe to make the next leg of the journey and bring to Salt Lake City siphon brewing, a technique that is unquestionably the best way to let the ‘beans speak’ in the purest sense of their aromatics and tasting notes. Although only a very few places in the United States had offered siphon brewing, the technique already had gained widespread acceptance in Japan and other Asian countries, including Yiching’s native land of Taiwan. The switchover from French press, a brewing technique that had consistently impressed Caffe d’bolla customers, was a long, patient process. First, the Piquets ordered siphon brewers from Japan and tested them for several months, tweaking with scientific precision elements of ratios, grind, heat, and duration. Only then did they confidently conclude that siphon brewing carried significant advantages over the press method, which had been reliably good up to that point in their business’ formative experience. 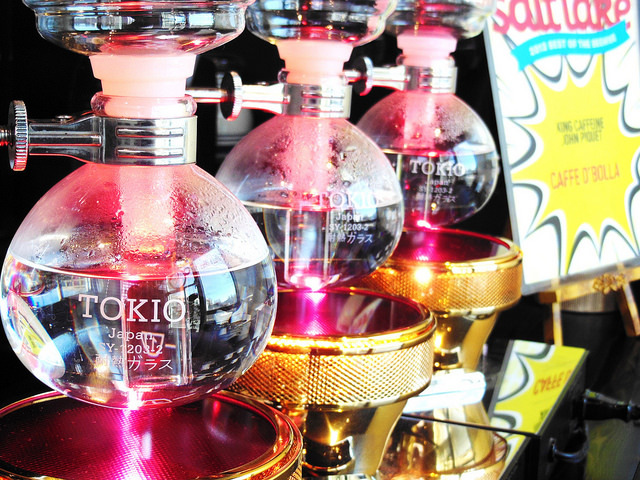 Their research carried over into several trips to Japan, including visits to, as John recalls in a blog post for Specialty Coffee Retailer magazine, “places like the long standing Hanafusa in Kyoto to little known owner-operated shops such as Rivage in Osaka, and beautifully designed siphon bars in shopping malls,” as well as tea shops in Kyoto and other spots. The siphon brewers at Caffe d’bolla, the purest way to enjoy fully single origin bean coffee. At the point when siphon brewing was introduced at the store, the Piquets already had tasted literally thousands of cups. Several years later, siphon brewing has captivated a steadily growing number of customers, as Saturdays, in particular, have shown. For new customers, John walks them through the process, explaining how siphon brewing is the ideal platform for showcasing high-quality coffee and how to enjoy the coffee. While the aromatics coming off the fine china cup with the freshly brewed coffee which has been placed in front of a customer tempts the individual to take the first taste, John cautions to wait at least five or six minutes until the coffee’s temperature has moderated to the ideal point when the coffee’s full profile of tasting notes and textures begin to come into full focus. Customers are introduced regularly to different offerings of single origin beans that are roasted on site, and are available for sale and on a rotating menu for siphon brewing. It should be emphasized that the Piquets do not purchase commodity grade coffee whatsoever and rely exclusively on specialty grade coffees coming from small farms in which pricing is based on quality and sustainable and effective coffee agricultural practices with clear benefits to the farmers and growers (an important distinction from the popular yet misconceived notions of ‘fair trade’). This means that coffee beans are assured of being consistently high quality. Most recently, Caffe d’bolla’s coffee beans have come from farms in Colombia, Brazil, Ethiopia, Guatemala, El Salvador, Sumatra and Kenya. Steadily growing numbers of customers from points throughout the country also have purchased Caffe d’bolla coffee subscriptions. 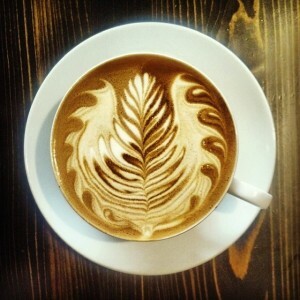 Yiching Piquet’s expertise in latte art at Caffe d’bolla. Those same standards of excellence also carry through the store’s other offerings including tea, pastries, and the always popular bubble teas. Previous articleLeo Libations: Eat and drink the science! Very nicely written article. I am going to have to try to remember some of the names they used here. Sounds like a fantastic place to try if we are in Utah sometime soon.